Well, well, well, YB Tony Pua seems to have rediscovered his voice (Kudos to Francis Yeoh´s ...). Pua was so quiet when YTL and royal partner SIPP got the power project via negotiated tender from the Energy Commission. By right, he should have immediatley condemned not just the EC and SIPP but also YTL Power - even TNB - over the negotiated tender. But especially YTL because of what Francis Yeoh said about crony capitalism. I have to say |I´m not surprised that Pua is all praise for Francis Yeoh again (read my Feb 19 posting Tony Pua a YES man) and out to get the EC and Putrajaya now that YTL has come out to say it was opting out of the deal ¨¨to dispel any misgivings over the government´s commitment towards transparency and good governance¨¨. Right on cue. Tony Pua is trying to make YTL look like the hero. Well, YB, let me tell you something: you can´t fool all the people all the time. I agree, the EC has a lot to explain; in my posting h e r e I asked if someone at the EC was resigning over this scandal. But make no mistake about it: YTL Power is no hero in this scandal. If we really need a hero here, then we should salute the trade union leaders at TNB who fought against the attempt to get their company involved in what they saw as an unholy alliance (read h e r e). 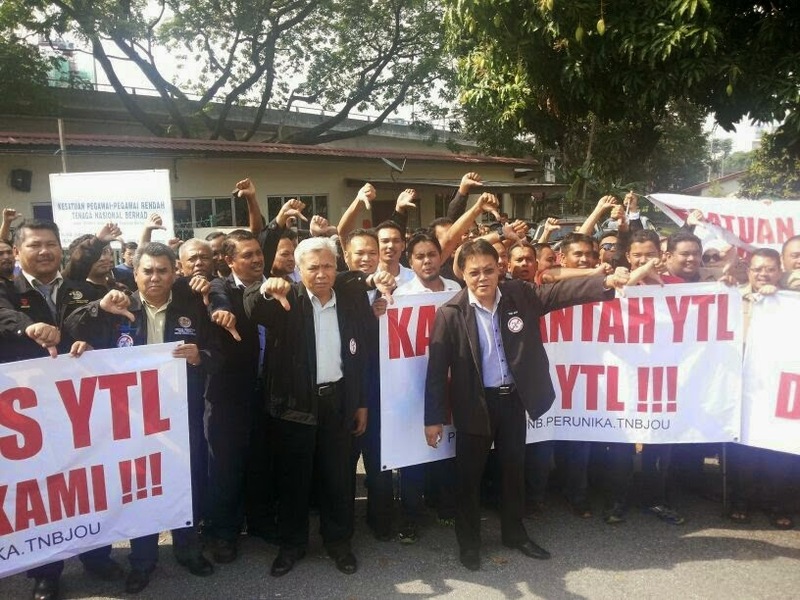 YTL 'Power '- tanah melayu sudah menjadi tanah cina. Dosa melayu tanggang yang tidak di ampunkan... Greater KL? What real hero.spin,spin,spin.if real hero the award to ytl is not happen in the first place.we even dont need ipp. This Tony Pua has been inconsistent on his stands on different issues. He was or still is opposed to the MRT project and was very vocal against Malaysia's purchase or bid to purchase littoral combat ships. However when asked by residents, what his stand on the KIDEX elevated highway was by concerned residents at a meeting in Section 4, Petaling Jaya, Pua said that he supported it in general if it would solve traffic congestion but was open to making changes to its routing where it would affect residents. Here theresidents president told him off strongly. Later he made a statement which was more favourable to residents and more against KIDEX. Now on the IPP issue, he supports YTL. An officer with TNB told me yesterday that IPPs have been a financial burden on TNB ever since they were forced upon it, because they force TNB to pay for electricity generated which it does not use, and costs are passed on to consumers. At the time, the head of TNB, Ani Arope refused to sign the agreement with the IPP and was promptly dismissed. That was during Tun Dr. Mahathir's long tenure as prime minister. This IPP thing must stop - FULL STOP. EC reports to Minister of Energy who reports to Prime Minister. The EC Chairman is A known yes-man. Anyone can guess who was the real culprit here. It's somewhere up the ladder. At the end of the day, all politicians, whichever party they belongs to, in the government or the opposition, they all have the same mission, once they have power enrich themselves and their family and friends. Have you never heard of 'spare the rod and spoil the child' ? It is only commendable to fight for your own kind but what you doing is just helping another generation going backwards. In fact what you are always seen to be advocating are more clutches and tongkats for the spoilt kids. What you should really be fighting for are for policies to help elevate these spoilt kids to be less dependent of the government and be more dependent of themselves. The helping the Malays policies has gone on not only since May 13 but even when the Brits were here as colonial masters. They started a military college, Federation Malay College in Port Dickson before Malaya was even granted the independence. Where the places, over 90% of them were allocated to the Malays and most of those Malay students became very successful, without much help from anyone went on to become very very successful senior civil servants. Those students were not only given the best in education but also the best physical education as well. You should be advocating more of these kind of assistants for the Malays, instead of being critical of views or actions of the politicians from the opposition parties. All politicians whether they are from Putrajaya or their oppositions are only interested to promote their policies. All will tell lies and made empty promises just to get elected. Take for example just before the last GE, didn't Najib promise to build 1 million affordable houses if he get to remain at Putrajaya. Now more than14 months later after he made the promise plus the fact that he is still the tenant of Putrajaya. How many of the 1 million affordable houses has he built or even planning to ? Do you know how much the 1 million affordable houses will do to the economy of this country. Most important of all how much help it would give to the people of this country ? Yet he has time to go jet around the world but not a single minute of his time is devoted to build the one million affordable houses ? Does he realise, for sure, what kind of support he will get if he did ? Likewise I think instead of putting so much of your time and energy on being critical of the oppositions. Just spend more of your time advocating for policies to alleviate the people in dire situations. Bru - just to get the picture straight - did you complain when the very first round of IPP awards was announced back in the day? Let me jog your memory. A certain politician, who is noted for his trademark sarcasm, was calling the shots then.